Duke has two of the best players in the country in Grayson Allen and Brandon Ingram, but a thin six-man rotation could hurt it in the NCAA tournament. With less than a minute remaining in the game, that 27-point lead seemed like it happened during Jay Bilas’s playing career. After Duke senior center Marshall Plumlee accidentally tipped in a Yale free throw miss, the Bulldogs found themselves down by just three points with 39 seconds remaining. They’d gone from being blown off the floor to threatening the biggest comeback in NCAA tournament history. 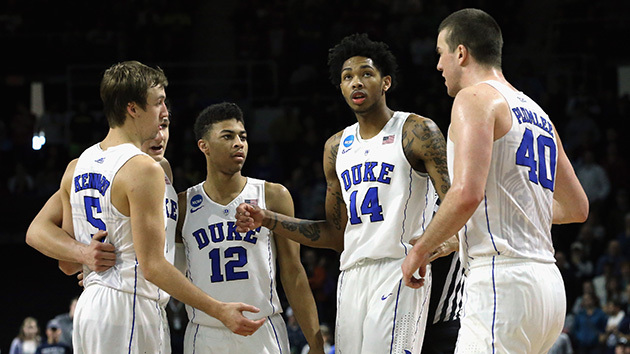 Duke settled down to restore order and topple Yale 71–64. But amid the frenetic extremes of a first-half blowout and a second-half meltdown, Duke showcased its potential and flaws. These Blue Devils are viable and vulnerable, with enough talent to defend their national title but enough holes to get outclassed in the West Regional in Anaheim, Calif. (They’ll face the winner of Sunday’s game between No. 1 Oregon and No. 8 St. Joseph’s). But Duke stayed composed when it mattered, a good sign for a young team that lost three one-and-done players to the NBA draft last year. Krzyzewski pulled the right strings down the stretch, including switching to a 1-3-1 zone that stalled Yale’s momentum. He also pounded the ball to Ingram in the waning minutes. Krzyzewski left the game impressed by Ingram’s work at the top of the 1-3-1 zone to rattle Yale point guard Makai Mason, as the zone changed the game just enough to allow Duke to hold on. After Duke lost senior forward Amile Jefferson to a foot injury nine games into the year, Krzyzewski worried about the Blue Devils even making the NCAAs, he said Saturday. That may be an exaggeration, but Duke clearly needed to overhaul its identity. The 6'9" Ingram has arrived as a transcendent NBA prospect whose production is beginning to mirror his potential. He scored 25 points on Saturday, including both ends of a one-and-one after Yale cut the lead to three points. (He did miss the front end of a one-and-one with 16 seconds left, but by then it was a five-point game). But those two stars can’t obscure Duke’s obvious weaknesses. Plumlee is a serviceable presence in the post, but he scored just one field goal in 31 minutes versus Yale. Freshman guard Luke Kennard helped Duke launch out to its big lead, then disappeared in the second half, scoring just two points. Junior guard Matt Jones is supposed to be a calming influence, but he managed to foul out without scoring in 20 minutes. Freshman point guard Derryck Thornton is serviceable but unspectacular. It’s not often that one leaves a game wondering why an underdog team didn’t press Duke more, but that was exactly the impression left after Yale rattled Duke in the second half. Nor is it often that such a player with a straight face will say of Duke’s thin frontcourt: “We thought we could take advantage of them on the inside and beat them up in there.” Yet that’s what Yale junior Anthony Dallier said in the postgame after Yale outscored Duke 32–18 in the paint.